This is the third post in a series about improving my computer room to serve as a full-time office. 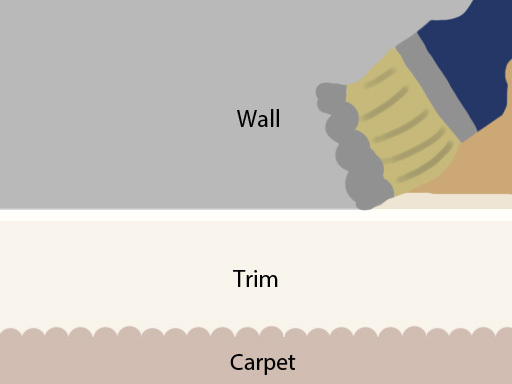 Today’s post is mostly about my trim painting technique. If you’re like me, you 1) like the look of white trim but also 2) balk at the expense of hiring a professional to replace all your trim, especially if it’s functional otherwise. I’ve talked about my trim painting technique before, but this walk through is much more detailed. 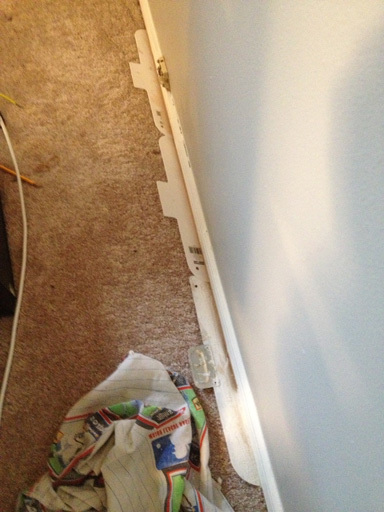 My wood baseboard trim is unpainted and unstained, so it’s ready to receive paint without any sanding or stripping. 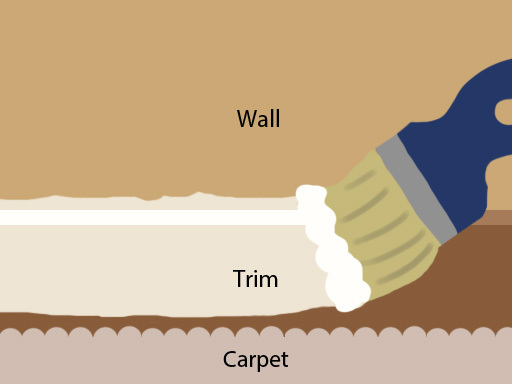 If your trim is already painted or has a glossy varnish, you may need to first strip and sand your trim, which probably cannot be done over your carpet. Or just paint over it and see how it holds up. This project takes about a full day for typical size bedroom. Be careful! You’ll need to keep track of what sides of your shields have wet paint on them. Painting tape: Optional. 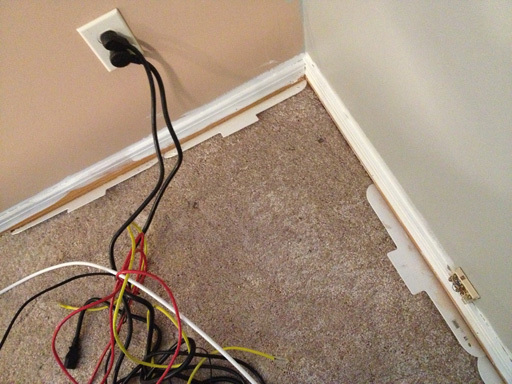 Since I paint the walls after I paint the trim, I don’t need to tape the walls to protect them. 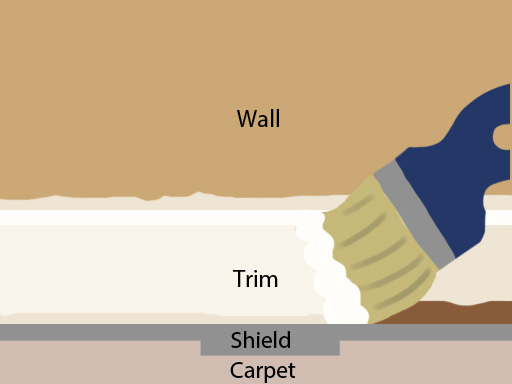 If you are only doing trim, you may wish to tape along the bottom of the walls where they meet the wood trim. Step 1: Paint the top 3/4ths of your trim. If your trim’s like mine, it’s going to need a few coats. I like to do this first coat quickly so it can dry as I do other things. I do this I do it before I finish painting the walls so I don’t have to worry about not getting paint on the walls, since painting the walls will cover up any sloppiness here. I like to do this first coat without bothering with the shields, since setting them up takes time and gets them covered in paint. Once the shields are in place, you’ll paint the trim again, this time going all the way to the bottom (as far down as the shield allows). Your top 3/4ths get a second coat and the part covered by carpet gets a first coat, which in most cases is sufficient. If you need to do a second coat just leave the shield in place and come back in 10-15 minutes to paint a second coat before removing the shield. Don’t let paint pool on the shield, and don’t let paint form a bridge between the shield and the trim. If this happens, you may find it difficult to remove the shield. I like to remove the shield before the trim paint is fully dried. Much has already been written about painting walls, but while waiting on the trim to dry is a good time to get it done. That’s it! I’m sure there are other ways to get this done, so experiment if you think there’s a faster and better way!